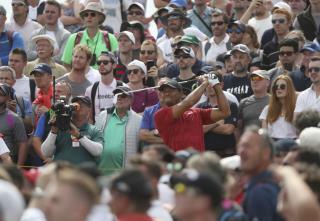 (Newser) – Francesco Molinari played a steady hand amid another crazy ending at Carnoustie and won the British Open to become Italy's first major champion, per the AP. Tiger Woods took the lead on Sunday at a major for the first time in nine years and lost it with one bad swing. Jordan Spieth cost himself another chance in a major by failing to make a single birdie. Seven players had a share of the lead at some point. Six were still tied on the back nine. Through all that suspense, Molinari never flinched. He closed with a 2-under 69, playing the final 37 holes on the toughest links in golf without a bogey. The clincher was a bold drive on the 18th hole that flirted with edge of a pot bunker, a wedge to 5 feet and a birdie putt that made him a major champion. I get that he was the best. But it's been nearly ten years. This guy screwed up his career and he isnt getting it back. Let's hype it up if and when he actually makes a comeback.